Hey plankton hunters! This week we are showing off four exceptional zooplankton found by you, our keen-eyed and inquisitive citizen scientists. We are amazed at how many plankton species have been uncovered on the site and just how capable you all have been at discerning some truly tricky taxa from the varying forms and shapes captured by the ISIIS camera. We thank all of the citizen scientists for your participation on the Plankton Portal! These images found by our citizen scientists continue to excite and we are eager to discover what resides in the thousands of images yet to be seen by human eyes! This capture of an anthomedusa is definitely a prime example of how the images captured by ISIIS can be equal measures fine-resolution biological data and one-of-a-kind organismal artwork. This gelatinous organism is baring all for us in this frame and we get a clear view of not only the striations on the exterior of the bell (the exumbrella) unique to this species and the fully extended tentacles, but also the central gastric pouch (stomach) appearing as the dark mass within the bell and the internal network of radial canals where digested food is transported. I think I can also see this critter blushing as ISIIS takes the snapshot! This medusa shown here is relatively uncommon in the images provided for you from the Southern California Bight, and we couldn’t be happier that our fantastic and dedicated group of citizen scientists spotted this gelatinous beauty. Annatiara affinis is a hydromedusa like many of the #4tentacles and #morethanfourtentacle medusae found on the site. The unique (and photogenic) lines appearing along the exterior of the bell were very helpful in pinning down an ID for this critter. From what we have seen, this seems to be a rare image captured of Annatiara where the tentacles are fully extended from the margin of the bell, and we are extremely grateful that this lovely jelly was so at ease in front of the ISIIS cam. 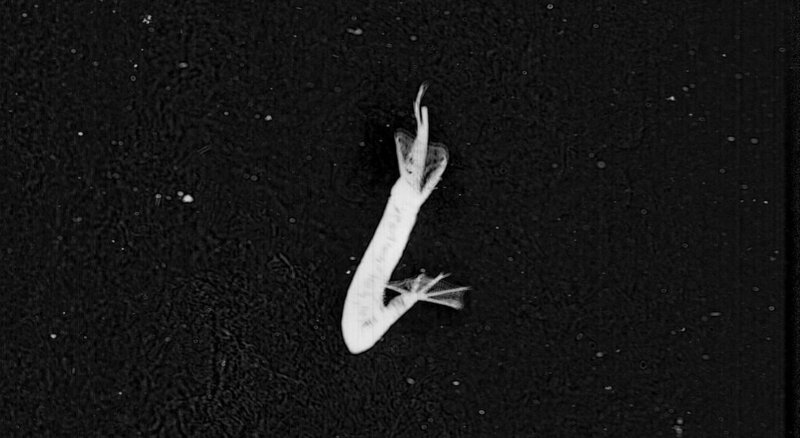 This is one of the largest shrimps I have seen on the portal and provides a great side-view of the crustacean anatomy. The orientation of this shrimp with the abdomen tucked under the carapace (upper shell) and the antenna trailing sharply away from the head indicates that it is moving rapidly towards its posterior (bottom left of image), using a swimming stroke known as the “cardioid escape reaction”—slapping the abdomen shut and quickly propelling the crustacean away from the perceived danger. This specific behavior played an important role in the field of neuroscience, in fact. When it was discovered, this behavioral response was the first example of a “command neuron mediated behavior”— meaning a specific behavioral pattern resulting from the stimulation of a single neuron. I wonder what stimulated this crustacean’s command neuron? Perhaps it is camera shy. I’m curious if that dark blob may be some out-of-luck plankter soon to be nabbed by this voracious predator. I am especially fond of these in focus captures of chaetognaths. The dart-shaped body and the hydrodynamic taper of the paired lateral fins really show off the sleek and elegant body plan of these brutal invertebrate carnivores. The chaetognath body has a protective outer covering known as a cuticle, a tough but flexible non-mineral layer exterior to the epidermis. Chaetognaths are notoriously efficient predators and hunt other planktonic organisms using hooked grasping spines that flank the mouth. A hood arising from the neck region can be drawn over or away from the hunting spines, much like the action of sheathing and unsheathing a blade. Equipped with an armor of cuticle and sword-like spines these guys are definitely well suited for combat! The siphonophores love to put on a good show for us here on the portal and this frame is truly exceptional. 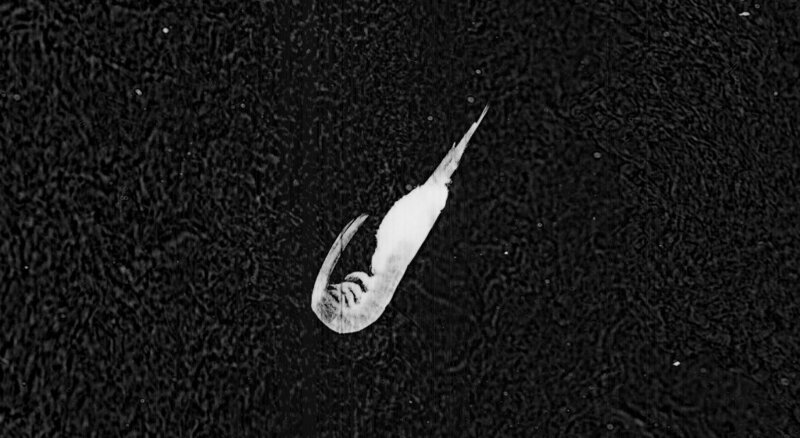 The shadowgraph imaging technique used by ISIIS lends itself to capturing in detail the elaborate gelatinous structures displayed by these colonial organisms. Siphonophores are comprised of many single animals, or zooids, which are highly specialized and coordinated in function. The zooids of a physonect siphonophore arise from a long stem at the end of which is a gas-filled float referred to as a pneumatophore. 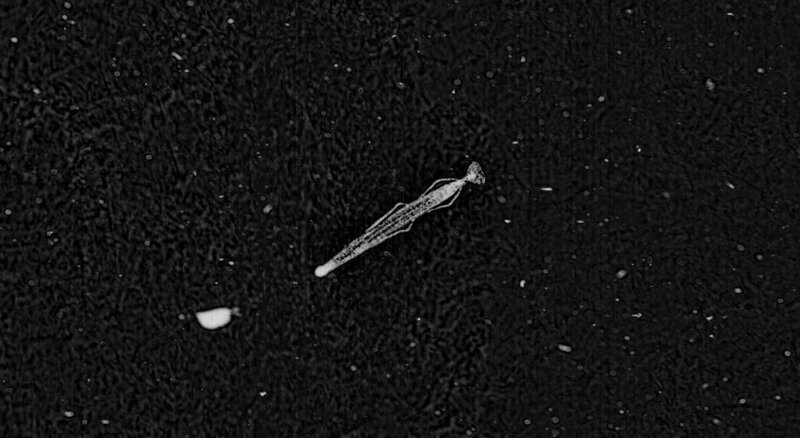 The pneumatophore is on display in this image here appearing as the dark, oval-shaped appendage on the upper left end of the main “body.” The portion that resembles a corn on the cob is referred to as the nectosome. The nectosome is composed of many swimming bells, or nectophores, each one of which is a single medusoid zooid. 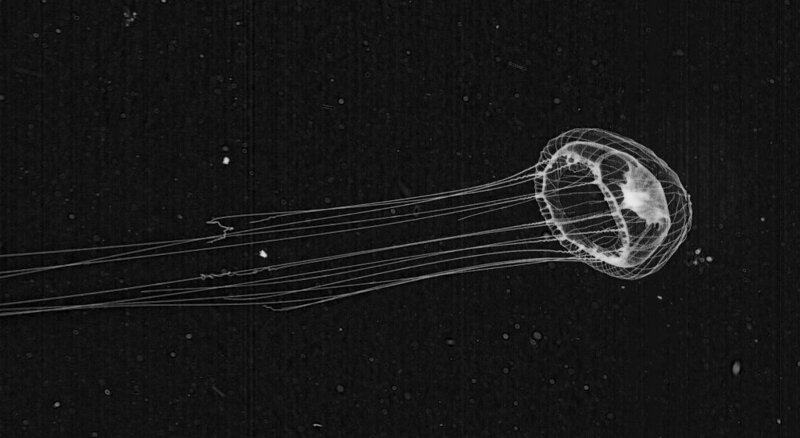 These nectophores display remarkable coordination among each other and the selective contraction of these zooids allows for the siphonophore to move and turn in any and all directions. 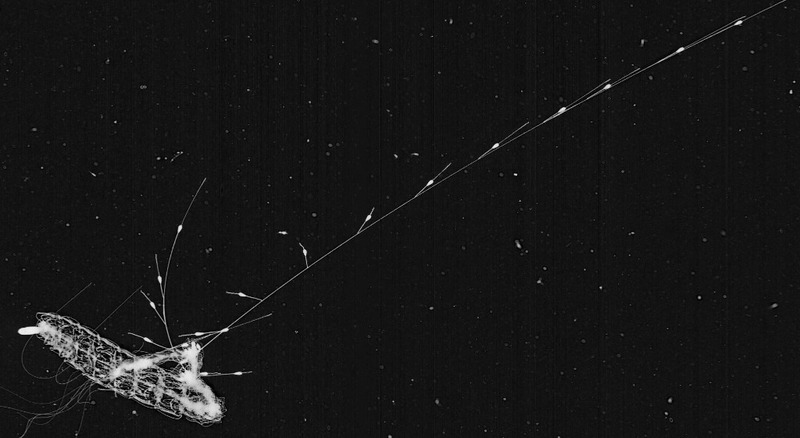 Physonect siphonophores are predators and rely on long, branching tentacles for prey capture. The one whipping across the frame here is definitely on the prowl. Each tentacle arises from a single feeding polyp situated below the nectosome in a region called the siphosome. You can see the siphosomal region on this specimen as the narrowing, darkly filled feature curling upward from the base of the nectosome. They sure have a lot of ‘somes’ and ‘phores’ but we forgive their repetitive nomenclature because we are always glad to find some siphonophores. We hope this has been a fun and informative look at a few of the many tremendous critters captured by ISIIS and found by the citizen scientists. If you come across an image you think is particularly cool on the portal then tag it with #FFF and we will check it out for use on the blog. As always, looking forward to the next Fantastic Find Fridays! This entry was posted in Fantastic Finds and tagged arrow worms, chaetognath, fantastic find fridays, FFF, hydromedusae, jellyfish, plankton, shrimp, siphonophores, zooplankton by bgrassian. Bookmark the permalink. and i wanted to ask about the siphonophores.. whereas they’re a colony of many single zooids, what happens when some of them die(if at all possible)? does the colony keep living? and when it dies? does it depend on which of the zoids die? or how many of them? and does it work the same for all the siphonophores we tag in the portal (corncobs, rocket-ships, twocups)? thanks! it’s really interesting post. The siphonophore colony may be composed of many individual zooids, but live and die as a single organism The zooids are so specialized that they could not function individually. For example, if a nectophore (swimming bell) were removed by some mechanical means, it would remain alive for a short while and perhaps could still swim but with no means of nutrient supply via the action of the feeding polyps it would eventually die. The zooids in a colony are functionally depend on one another and physiologically integrated. .. kind of like organs in our bodies. It’s a very interesting question you bring up and I am sure the answer is much more elaborate in the wild than I describe, but that is my understanding of it! her body is bent, but her tail is opened widely (not like in the escape posture). what direction is she going to? is she just trying to brake after an escape? I think that is a capture of the escape reaction as well, just at a different portion of it. From my understanding shrimp swim through the water column using their pleopods (legs along the abdomen) and only use the tail for locomotion during the escape response.